With the cold weather and the holidays approaching, I can think of nothing but comfort food. Arroz poblano is a staple comfort food in my home during the winter months and is a filling dish that can be served as a side or even as a vegetarian meal. Because the holiday rush has already begun and my schedule is getting tight, this is a great quick recipe because I use one big cheat to cut down on prep time: ready-to-serve microwavable rice. This arroz poblano recipe also has a unique twist from the typical one you might be familiar with that has chopped poblano and yellow corn kernels mixed into white rice. In my suegra’s house they always add crema Mexicana, which is something I’ve adapted into my own version of this family favorite. 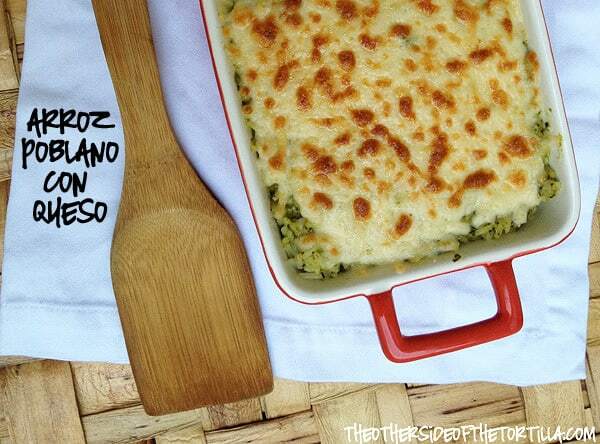 My recipe uses a blended poblano crema to coat the rice and keep it moist and a thin layer of cheese both in the middle and on top. If you’re worried about the poblanos being spicy, you can either soak them in a vinegar-water solution (read more about that in my guide on how to roast poblano chiles) or you can leave one chile out of the crema mixture. Be sure to remove all the veins from the inside of the chile too. A tip: because I cook so often with poblano chiles, I typically roast them once a week, let them sweat and come to room temperature, then refrigerate them until I’m ready to use. The prep time on this recipe is based on that method and using ready-to-serve rice that can be purchased in microwavable pouches. If you have to prepare your chiles and cook rice from scratch, your prep time should be around 30-40 minutes. 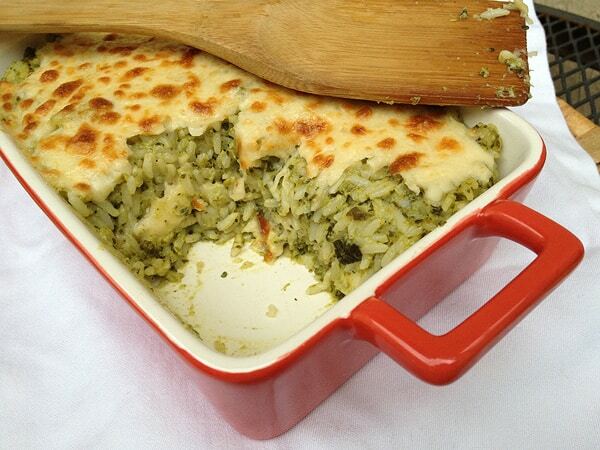 Poblano cream and shredded chihuahua cheese lend a twist to this traditional Mexican rice comfort food dish. Make your rice first according to package directions and set aside. Place 3 of the poblano chiles in a food processor or blender with the half cup of crema Mexicana and 1 teaspoon of kosher salt. Blend until the chile is completely incorporated into the crema. Dice the last chile poblano into little bite sized pieces. In a large mixing bowl, put your prepared white rice and pour the chile crema mixture over the top. Stir well to coat the rice completely. Add the diced poblano chiles and stir to distribute them evenly throughout the rice mixture. Spray a small casserole dish with nonstick cooking spray. Add half of the rice mixture to the dish. Sprinkle 1/2 cup of shredded chihuahua cheese over the rice and add the rest of the rice on top. Add the remaining 1/2 cup of cheese over the top. Put the casserole dish under the broiler in the oven for 5-7 minutes, or until the cheese has completely melted and has some brown spots. Do you have a favorite Mexican rice dish? Tell me about it in the comments! This sounds great! I would probably add more vegetables – diced onion, blanched diced nopal, maybe zucchini… I’m gonna try it. I’m going to try this. I HAVE to try this. Thank you, Maura! I’ll be making a double batch of Arroz Poblano for our Christmas Eve dinner! I can’t wait!